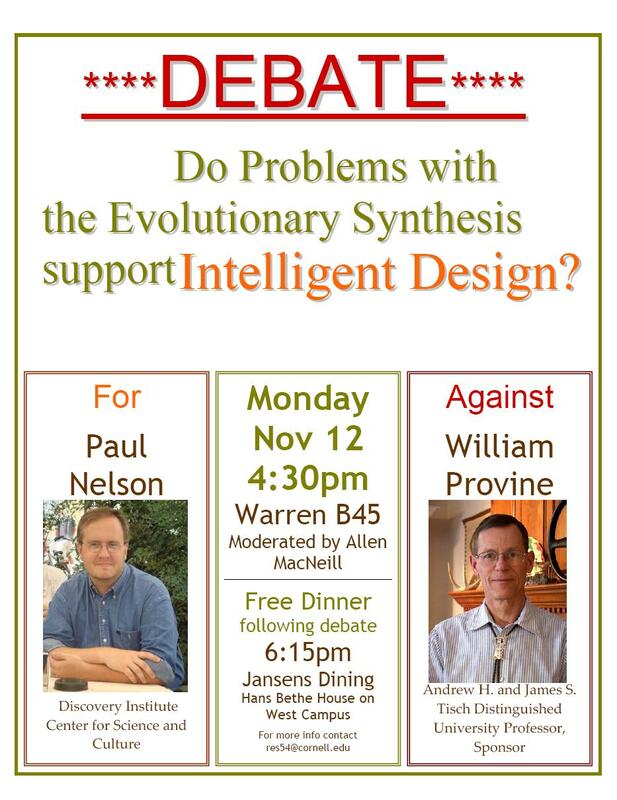 Provine and Nelson at Cornell, November 12: If Neo-Darwinism Fails, Then What? As an undergraduate studying evolutionary biology — like many other such students, I suppose — I read Will Provine’s classic The Origin of Theoretical Population Genetics (University of Chicago Press, 1971), a standard history of the laying of the mathematical and conceptual foundations, in the work of Fisher, Haldane, and Wright, of what later came to be known as the Evolutionary Synthesis (i.e., textbook neo-Darwinism). On November 12, Provine is sponsoring a debate (with me) at Cornell University, where the question on the table is this: If textbook neo-Darwinism — the Evolutionary Synthesis — fails, what follows? I’ll argue that ID gains support; Will tells me he’s going to argue that ID gets bupkis. But we’ll start by summarizing where we agree about the shortcomings of the standard theory. The debate, moderated by Allen MacNeill, will occur in Room B45 of Warren Hall, at 4:30 PM on Monday, November 12. A dinner will follow at the Hans Bethe House. Congrats to MacNeill, Provine and Cornell for this much needed debate. I hope the debate is recorded for distribution. All the best Paul. I hope it opens some eyes. This is an obvious truth since naturalism is falsified in generation of information…. Since science relentlessly pursues a more complete understanding of the truth,,,the next logical primary questions to be asked would be, At what time was the information implanted? The next, by what method was information implanted into life? If the timing and method of implementation of (at least) information can be ascertained to a high degree of certainty, then we may begin drawing inferences and asking basic questions about the nature and personality of the “Information Implanter”. Of course there are probably many other things that can be added to this list,,,but these few questions are the most basic answer to the “What Then?” question asked. That is that is the course primary investigation will take as far as the primary concern of biological science is concerned. If Provine is to argue that ID gets bupkis, and it seems that the quote you gave has him saying that natural selection also gets bupkis, then be sure to ask him what the he thinks the mechanism behind evolution is. “I don’t know” is an acceptable answer. Wow. The fact that this debate is even happening looks like a tipping point to me. At the very least, those Darwinists who are aware of the problems of NDE are retrenching at new positions and surrendering the old ones. jhugan — or they live in the Yukon (just south of the north pole) and have two children to feed. Provine seems to have gone a bit far in dismissing natural selection but it would definitely be more apt to call it natural deselection. It certainly works pretty well at culling disastrous random mutations. I’ve no doubt worth mentioning that natural deselection is responsible for deselecting less disastrous but still disadvantageous alleles such as deselecting black bears in the arctic or deselecting small finch beaks in drought conditions. Why do you tease us? Is the debate public? Where can I purchase tickets? Will it be recorded and posted online? Rather than list them go to MacNeill’s blog for them. It will keep a lot of people talking for quite a while. By the way it was announced today or yesterday that they have created super mice that live longer, breed longer, run for longer periods of time, have less weight and have other positive features. This is all through the alteration of one gene. It’s quite a list of sources of variation. It would seem that non-experts are no longer qualified to doubt the theory given the apparent complexity of the subject. On the other hand, David Berlinksi says you can learn everything you need to know in a few hours. Who is right? Why do you tease us? Is the debate open to the public? Where can I purchase tickets? Will it be recorded and posted online? It appears they are not retrenching but dramatically expanding the naturalistic sources of random variation. Random variation was always the Achilles Heel of modern evolutionary theory and MacNeill and Provine know this and have provided a mouth full that dwarfs point mutations. This looks like a serious attempt to jump to the head of the line in the evolution debate. Each will have to be assessed one by one to see how much substance there is and not just smoke and mirrors. Paul Nelson better be prepared. Default question: are they recording this and will the audio be available? This should be a standard part of agreement. Saskatchewan and the Yukon are so much closer than Tasmania (That’s in Australia, not Tanzania in Africa … which is also a very long way away!) to go and see these cutting edge dodge and parry events. ID is global: I hope with the technology that is now available that we are able to quickly and adequately share our insights, victories and setbacks. The global ID community is a vast resource that is just being tapped. There is so much to offer and learn. I have read Macneill’s “list” and I am really amazed! I knew darwinists were losing their reasoning abilities completely, but I couldn’t suspect they were so ahead in the process. This guy is even better then Dawkins! Yes, changes, but cuased by what? Usually, RM. 2) Obviously, apart from single nucleotide mutation, there are indeed other random mechanisms of variation: they are, essentially, duplication, inversion, deletion, fusion, and similar. The only difference is that they involve big blocks of DNA (up to a whole genome) instead of a single “bit” (in the sense of nucleotide). They are, anyway, perfectly equivalent to RM as to their power to create information, indeed probably worse. After all, if you have to write a random new code, it’s probably easier to randomly change each single bit at a time than to work shifting big blocks of code randomly. 3) As far as ID is cioncerned, “any” random variation has the same value, and every ID arguments applies just the same to “any” random variation. 4) Mechanisms as lateral gene transfer, sexual recombination, etc, are mechanisms which can only mix information which already exists. They have an important role in creating variation between individuals, and in bacteria are certainly responsible form many interesting phenomena (so that bacteria can probably be considered a “collective” genetic organism). But they are absolutely unable, for instance, to generate a “new” protein or function, unless that comes randomly (and then, the previous point applies). 5) Regarding the 3 mechanisms “that result” from the above list, “natural selection, sexual selection, and random genetic drift”, obviously only natural selection has at least a meaning (although ambiguous). I will not comment about sexual selection, because I am not sure to really understand what he means, but I would like to mention, again, that genetic drift does not select anything, is only a proces of random reshuffling if neutral mutations, and, whatever its relevance in the real world, it is completely irrelevant for the purpose of creating information. So, what are we back to? RM (or, more correctly, RV, but there is really no significant difference for the ID arguments) and NS. I glanced over “the list” and it still boils down to a random variation of some sort,,,Sanford in His Book Genetic Entropy goes over many of these variation and points to his experimental work in plant genetics showing how each decreases information from parent species! Of course, as DaveScot did in his reading of Sanfords book, you may have to clean the data of the “stretching” Sanford gave it to fit his bias of YEC. The underlying foundation of evolution demands flexibility at its most basic level (SNPs) for any of the more complex random variations to even be considered plausible in the first place! The plan fact is that conservation of information WILL hold no matter what level they try to find it on…As Dembski and Gitt have clearly pointed out…NO natural random process is going to generate complex specified information! So between Dr. Behe’s and Dr. Sanford’s evidences you should be able to present the proper hard empirical evidences to invalidate most all of their conjectures they have and shall put forth. It really is amazing that they can’t see the fact that random variation being disproven at its most basic level (SNPs) invalidates all other higher level variations no matter what type they are!!! Sigh,,,,Oh well,,,at any rate the other types of genetic variations they may bring up are covered by empirical evidence as well. The proof of the limitation of their 46+ processes to affect any significant change in the genome is in the pudding. And there is no pudding. Can you imagine any Darwinist or what MacNeill or others will want to be called remaining silent if there were any pudding. If there was a concrete example of the power of these 46+ processes do you think we would hear the end of it. I must be deaf because I do not hear them barking. As I have always said the best metaphor for the materialist approach is Sherlock Holmes’ dog barking in the night. There was no dog barking in Silver Blase and there are no materialists barking and what we see on MacNeill’s website is probably an attempt to spam in order to confuse the debate. However, each supposed process of new variation will eventually have to be dealt with to show they haven’t produced anything. what we see on MacNeill’s website is probably an attempt to spam in order to confuse the debate. So for some unsolicited advice from me,, don’t be afraid of their fancy shadowy rhetoric and keep dragging them back into the light of what is thoroughly understood. I think someone should start a thread on the super mice or what is being referred to as Mighty Mouse. This is obviously a result of intelligent design but the point I believe should be discussed is what would happen to the ecology if such genes got out into the wild. I find it scary that all of a sudden we have a dramatically physically superior organism. While a mouse is a small mammal and represent significant problems, what would happen if the same genetic changes were to appear in much larger animals, especially predators. Then there will be the issue of the engineering of the human genome and the consequences of humans having these increased capabilities. This is apparently a simple modification. What are we in for? Ex-pat halfway between you and bfast in the land of Oilers and Eskimos. I don’t think these mechanisms would be listed unless there was positive evidence they were at least potentially effective. So I would finish this sentence: “each supposed process of new variation will eventually have to be dealt with to show they haven’t produced anything” beyond the trivial predicted by ID. I thought the following excerpts from Professor MacNeill might be good review for what was proposed by MacNeill Nov 2006. He commented in response to “We is Junk” Nov 10, 2006 post by PaV. (4) non-binding sequences: those DNA sequences that are not transcribed into RNA, not translated into protein, nor function as binding sites for regulatory moelcules. Such sequences would include highly repetitive sequences, tandom repeats, “spacer DNA”, pseudogenes, retroviral and transposon inserts (both “dead” and potentially “alive”), etc. This latter category could be further subdivided into “functional” non-coding/non-binding DNA sequences versus “non-functional/parastitic” non-coding/non-binding DNA sequences, depending on whether they arise as part of the functional architecture of the DNA (primarily of eukaryotes), or whether they arise as side-effects of the action of parasitic genetic elements, such as retroviruses or transposons. There may be other categories of DNA sequences that have other functions, but right now I can’t think of any. Therefore, this is how I intend to teach the concept of a “gene” to my students at Cornell from now on. How much has changed since then? As has been pointed out, these are all stochastic in nature and can therefore be classified as mutations (i.e., undirected, purposeless changes). The forest is not being seen for the trees. The bottom line is that you still have to get from a program like this, to one like this, with no planning, design, or foresight, only random events. Personally I’ve long thought that we need a new term to encapsulate all proposed Darwinian mechanisms. I’m pretty sure many people use RM+NS to indirectly refer to everything but extending RM+NS is likely just to confuse people. I like “RV+NS” myself. The debate is open to the public and free. No recording is planned at this time. Sorry for off topic, but wow! Great piano work. Enjoying the Chopin and Liszt now. Great piano work. Enjoying the Chopin and Liszt now. Another classical music convert? My heart is warmed and encouraged. Objection #3-The failure of the Primary Axiom (RM/NS) is not a serious challenge to evolutionary thought. What does it matter if the Primary Axiom is ly flawed and essentially falsified? The primary Axiom (RM/NS) is just one of numerous mechanisms of evolution, and so is not crucial to evolutionary theory. Evolution researchers just need some more time, and some more funding, to work out the few minor kinks in their various theories. a. There is only “one” evolutionary mechanism. That mechanism is mutation/selection (the Primary Axiom). There is no viable alternative mechanism for the spontaneous generation of genomes. It is false to say that mutation/selection is only one of various mechanisms for evolution. Yes, there are several types of mutations, and yes, there are several types of selection, but there is still only one basic evolutionary mechanism (which is mutation/selection). The demise of the Primary Axiom leaves evolutionary theory without a viable mechanism. Without any naturalistic mechanism, evolution is not significantly different from any faith-based religion. b. Darwin’s only true inovative concept was the idea that the “primary creative force” in nature might be natural selection. Yet he had no conception of genetics or mutation, and therefore had no conception of what was actually being “selected”. His general view, that natural selection could explain all aspects of biology, was simply his vigorously advanced philosophical positon. Not until much later did the neo-Darwinists sythesize genetics, mutation, and natural selection – creating the field of population genetics. Only then did Darwinism take on the appearance of real science. Ever since that time mutation/selection has been, and still remains, the singular lynch pin holding together all aspects of Darwinian thought. c. Degeneration is the “precise antithesis” of evolutionary thought. Therefore the reality of Genetic Entropy is positively to Darwinism. Many people are claiming the concept of Intelligent Design cannot be approached scientifically, but is only a matter of faith. However it is obvious in biology the “Null Hypothesis” of Intelligent Design is mutation/selection. We all know that to disprove a Null Hypothesis is to strongly support The Hypothesis. Therefore any scientific evidence which demonstrates that mutation/selection can “not” create or preserve genomes, is sound scientific evidence supporting Intelligent Design. A duplicated region adds no new information until beneficial mutations are somehow incorporated into it-….but in reality he knows the only way to climb “Mount Improbable” is through a very long series of infinitesimally tine steps. In appendix 4 page 191, Sanford addresses Polyploidy,,it was his special area of study during his PhD thesis! Discussion of required mutation rates, page 43 f,g, and h.
1: Dr. MacNiell, are you really suggesting that IDers are so shallow as to think that point mutations are the beginning and end of what we mean when we say RM or more accurately RV (random variation)? And you talk about strawmen?! 2: These are examples where, according to the theory, some DNA duplication process randomly “goofed”. IE, RM!! 3: These are the product of some random mutational event, are they not? Or are they the product of a mechanism that was ostensibly developed via RV+NS? 4: Is this an example of a glitch in duplication, or as Spetner suggests, is this a mechanism ostensibly developed via RV+NS? 5: What is the cause of DNA methylation, is it a mechanism developed by an organism, or is it the an organism randomly encountering alcohol and having the expected reaction? In either case its either RV, or a mechanism ostensibly developed thereby. 6: A mechanism developed ostensibly by RV+NS. 7: Is HGT a random event, or is there a mechanism inspiring it to happen, such as a mechanism for organisms to share a resistance; a mechanism which is ostensibly developed via RV+NS? 8: A fun concept. However, I fail to see the non-randomness in such integrations. If there is a non-randomness, it will be explained as a mechanism developed ostensibly by RV+NS. 9: All environmental changes can redily be seen as random variation unless the organism creates the environmental changes itself. If the latter, then it is ostensibly the product of RV+NS. Dr. MacNiel, there is NOTHING in the modern theory of evolution that is not encapsulated by Random Variation and Natural Selection, or its little brother, mechanisms developed by RV+NS. This is not a strawman, your implication that IDs view of evolution is nothing more than point mutations is the strawman! YOU ALL ARE MISSING THE POINT!!! ID does not say that evolution cannot happen. It does say that evolution, in order to occur, must be teleological. Nearly all of Allen’s list is teleological evolution! Informationally-directed evolution is what ID is all about. Allen’s list is _precisely_ a list of informationally-directed mechanisms of evolution. As one study put it “Each and Every possible single-point mutation occurs between 10^4 and 10^5 times per day in an HIV-infected individual.” (HIV population dynamics in vivo Collin J.M., 1995). Every double point mutation, where two amino acids are changed simultaneously, in each person once a day. (This means a chloroquine-type resistance mutation-where two particular amino acids had to appear before there was a net beneficial effect-would occur in each aids patient every day. Not that’s mutational firepower!) In fact, just about every possible combination of up to six point mutations would be expected to have occurred in an HIV particle somewhere in the world in the past several decades-double the number that could occur in the slower mutating P. falciparum. In addition to all those point mutations, enormous numbers of insertions, deletions, duplications and other sorts of mutations would occur as well. In my opinion this is powerful proof that evolution is not capable of generating the complexity that would be required to change a mammal into a whale or a monkey into a man for that matter…. I expected this one point of Dr. Behe’s book to be attacked vigorously by Darwinists. Since HIV is one of their strongest proofs that evolution appears to be occurring. Yet the only major rebuttal of this crucial point of HIV stasis came from a Grad student, named Abbie Smith, on, of all places, Pandas Thumb. One more piece of evidence that may, or may not, be of help to you. There are many ancient bacterium fossils recovered from salt crystals and amber crystals that have been compared to their living descendants of today. Some bacterium fossils, in salt crystals, dating back as far as 250 million years have had their DNA recovered, sequenced and compared to their offspring of today (Vreeland RH, 2000 Nature). Scientists accomplished this using a technique called polymerase chain reaction (PCR). To the disbelieving shock of many scientists, both ancient and modern bacteria were found to have the almost exact DNA sequence. Though they do some weird contortions to try to make the evidence fit an evolutionary scenario in their paper,,,the weight of the evidence from both Behe and Vreeland (not to mention the law of conservation of information by Dembski and Gitt) is very compelling to stasis and does not support macro-evolution happening at all! Those are quite a few lines of evidence converging on that fact! So if you can present this evidence of a consistent finding of stasis in almost every ancient bacteria studied, it will be another powerful evidence you can use. Using a technique known as polymerase chain reaction, the scientists copied and sequenced a strand of the B. sphaericus DNA. The purportedly ancient DNA resembled a segment from modern B. sphaericus but did not match exactly, providing further proof that modern bacteria had not contaminated the experiment, the researchers say. 2. Proves that evolution is indeed not occurring to the bacteria DNA at the minimal accepted and required “molecular clock” rate. For all practical purposes, it seems the best evidence we have for ancient bacteria DNA, strongly indicates that the rate is, in effect, frozen. If a rigorous test for robustness, between ancient and modern bacteria, can be ascertained that will confirm that it is indeed in line with what Genetic Entropy will predict in its full fleshing out, then this evidence will be incontrovertible! It is nice to see my view vindicated on here, since I had to argue a while ago about this. NS is not a force or mechanism of any kind, it is the description of a result; it doesn’t cause anything itself. Nice to find out that even some Darwinists can see this. I said it before, and I love to say it again. If cat is selected, natural selection wins. If mouse is selected, natural selection wins. If dog is selected, natural selection wins. If cat and mouse and dog are NOT selected, natural selection also wins! Natural selection is a process that is constantly at work in nature. It just has trivial things to work on in terms of evolutionary biology so it produces trivial results in this area. In terms of genetics and medical issues it can be an exceedingly important process. I’m still trying to understand how common descent can happen without natural selection. I have yet to hear a logical explanation. Natural selection, by definition, selects random genetic variants….and as a by-product of eliminating NS from the equation, one, it would seem, would also have to eliminate the idea that random genetic variants fuel evolution, and thus, common descent. People like Behe doubt that NS has any real power to evolve a population of organisms into different types of organisms, but what exactly is the explanation for common descent without it? I’m still trying to understand how common descent can happen without natural selection. I have yet to hear a logical explanation. Joe, please look at exactly what common descent means — it means that every organism has a parent, or in the case of single-celled organism, every organism is the result of the division of its predicessor (parent) into two. That’s all it means — how variety occurs within this simple paradyme is not defined by the term “commmon descent”. If genetic engineers modify a mouse, they begin with a living mouse, they add a gene, then they let the modified mouse produce offspring. Is the resultant geneticly modified mouse somehow not the a common ancestor of its mother and father? Of course it remains to be a common ancestor, common descent is not destroyed. By the same token if an unknown designer twiddles with genes, common descent is not broken just because twiddling happend. Secondly, the front-loading community, such as Patrick, will point out to you that it is not at all unreasonable for the first living organism to contain a pattern of DNA that is not implemented in that organism, but is passed on to its children in such a way as to guide the development of modified offspring. (The front-loading hypothesis is somewhat more complex than that, but its a good summary.) Again, if the offspring implement the embedded code, common descent is not broken even though it is not natural selection, or not purely natural selection that is guiding the process. Therefore there is no common descent = natural selection eqation. Natural selection requires common descent, but common descent does not require natural selection. No that is not correct. The word random should be removed from your phrase. The whole debate is over where the variation comes from and so far random processes are inadequate to supply the variation that exists in populations. As I just said on another thread, natural selection is working all the time. It just has little new to work with so it essentially ensures the status quo as opposed to producing new phenotypes. So the 64 dollar question is where diid the variation come from. I _think_ I understand your question, but I apologize if I answer another one. #2 is the more interesting to me, even though I don’t believe in universal common ancestry. In #2 the original organisms were pre-configured with enough information to produce divergence. So, for those in the universal common ancestry camp, that means that the original unicellular organisms contained either the information for producing multicellular life (in at least somewhat of a dormant state), or they had sufficient information to produce such variations as needed. The reason, then, for such events as the Cambrian explosion, is that this is simply a combinatorial arrangement of existing genetic material. This is why we never find true intermediate structures. Even if a structure is in its first time to be generated ever, it is using sufficient information to make it in a fully-functional, fully-usable state. This is also a possible reason why the “tree of life” is actually a bush. The early divergences were simply recombining existing patterns already present in the genome. This would lead to very large amounts of overlap in terms of genetic and phenotypic diversity in different groups, since in the earliest forms they were all from essentially the same gene toolkit, and retained those genes dormantly for some time afterward. telicthoughts.com covers discoveries in this area quite frequently. – how does front loading happen? That is, let say humans aren’t the “final frontier”. Perhaps from humans, another species will emerge, say one with eyes in the back of their heads. So, what happens? Does the Designer choose who gets to have the 3-eyed child? That is, is it your kids or my kids that have the three eyes? And, if its just mine, how do we keep the lineage growing. My kids have to have lots and lots of kids, or the line will die out. If its multiple people having 3-eyed kids, how is that timed? Does the Designer say in 2008 that x number of humans born will have 3 eyes? Also, if its just one, and you are the one, did the Designer know you would be created from your grandparents, great,great,great grandparents, etc.? And, did the Designer know that you would not die before your had a chance to reproduce? Front loading seems really logical, given the information in the genome, but with NDE or even front loading I’m having a very hard trying to “spin a story” as to how it could have happened. Appreciate everyone’s answers…thanks for the info…. As I understand it, it is natural selection that is responsible for building up populations genetically. Therefore, in order to do so, it must select from random genetic variants. If the variants are not random, there is no sense in saying selection is responsible for anything in regards to adaptive change….if all the organisms in a population experience the same non-random cues then they are all likely to change as a result. Selection’s only role would then only be to weed out the freaks, runts, and underdeveloped…..or that’s how I see it. Thanks again for all the info. Joe. It is the source of the variation that is the issue and there is no reason it has to be random. That is something to be proved. For all Darwin knew the variation was present in all the members of the population and then when the population met a new environment, the variation that was most appropriate for the particular niche in which the organism found itself would eventually take over. Sort of like dog and pigeon breeding which Darwin used extensively in his book. The whole issue that is being debated in evolution is the source of the variation. Natural selection is a side shoe. To assume variation is random is begging the question. You are assuming an answer is true when what has to be proved is this answer. how does front loading happen? A designer would have a target/ goal in mind and provide the programming/ information and resources required to reach the target/ goal. Artificial selection could/would be a driving force. I agree. But then again, if variation emerges nonrandomly from within each creature, selection is left out of the loop other than being merely a conservative force. Also, if variation emerges nonrandomly, one must attempt to answer how this nonrandom variation occurs in the first place. From where does this wisdom come from? If it’s the mental capabilities within each creature that’s perceiving the environment and then acting accordingly, adaptively manipulating its physical structure, then what we have is a science of the mind, not a science of the mind, because the body then just becomes just a servant to the mind. If mental processes are thus in charge of evolutionary change, it must be questioned how in the world the mind of a creature can transform itself into a mind of a completely different kind of creature. I think this spells big trouble for science, who attempts to explain things materialistically and naturally. No one is proposing that the organism itself can change its own genome by any means. There is no evidence for this at all though different versions of this were popular in the 19th and early 20th century. How variation originates is the major mystery of evolution. ID proposes that in some cases it is due to intelligent causes. Though not all cases. We have an example last week where scientists developed a new mouse with superior endurance, life expectancies and breeding success. So here is an example of intelligent design in our time. There are points of view that the origin of all variation is natural and no intelligence was involved at all. That is the essence of this thread. Allen MacNeill claims his 47 processes can explain everything or in cases where there is some doubt it is only a matter of time before other naturalistic process are uncovered to explain things. The position of ID is that there is no evidence other than for trivial examples that can be attributable to these 47 naturalistic processes. As I said it is a mystery and that is what most of the debate is about. We have an example last week where scientists developed a new mouse with superior endurance, life expectancies and breeding success. So here is an example of intelligent design in our time. The mice you refer to deserve a thread in themselves. You make it sound like the scientists did some amazing engineering, where what they actually did was remove a gene. The fact that mice, minus one gene, are super-mice makes painfully little sense in light of the modern evolutionary theory. I see this as similar to children’s snowmobiles. They have a significant engine so that they can function in a variety of conditions, but they have an active governor so that they don’t endanger the child. Likewise it appears that mice are overengineered, possibly for similar reasons, but they have a governor gene. I suspect that they are governed to maintain the balance of nature, but I find it difficult to envision that they are governed to give themselves a competitive advantage, even thought they require more food. I am not sure what you are trying to say. I suggested a thread about this a few days ago and then I found there was one over at telic thoughts at that time. The telic thoughts site seemed screwed up at the moment. The first page has threads from a month ago so recent threads are currently missing. I mentioned that I did not know how the mouse was changed and asked if anyone had any ideas. On the telic thoughts thread someone said that a gene was implanted at a promoter site and this caused the specific enzyme to be expressed at 20 times the normal rate. And apparently this addition to the genome caused the change. It apparently caused increased mitochondria denisty but this was not planned but happened serendipitously. So as I said I await a discussion and more knowledgeable persons than I to dissect just what was done to the mouse genome. It is a scary phenomena because these mice have the potential to upset an ecology and from what I understand are very aggressive. That is absolutely what is being proposed. That is in fact what is happening. Faced with a biological problem, the organism initiates change mechanisms based on the type of stress it is facing, which then performs mutations until the right answer is reached. This is empirically documented time and again. The immune system is a prime example, and the SOS response of a bacteria is another one. The exact mechanisms are not known, but my guess is that it is very similar to non-deterministic computer programming. That is, you harness statistical randomness in specific ways, which guarantees good results in the face of adversity better than any other mechanism. Are we not talking about apples and oranges? One is the immune system and not gamete cells that are changing due to environmental stress to save the current organism. Is there any evidence that the DNA of gametes are being modified due to specific environmental pressures to meet the stress better for their offspring? I am talking about multi-celled organisms that sexually reproduce. The debate is not over what happens to bacteria. I am aware though far from knowledgeable that bacteria are constantly changing to meet environmental pressures but essentially remain bacteria and nothing really new happens. If what I said is not true then this is worth several threads. I have been poking around in this area for some time but have been unable to make any sort of rational contact with anyone on the subject. The neo-Darwinian program clearly wont work since for any rare genetic change, specifically the addition of a new gene, the process becomes strictly a genetic lottery and should obey the statistical distributions of such a lottery with the probability proportional to the number of “tickets” or individuals in the population whereas in the real world all species acquire new genes at essentially the same rate independent of population size. It is easy to show that the possibility of an organism actively evolving in a preferred direction is compatible with all known physics, chemistry and biology other than the “principles of neo-darwinian evolution”. There are some very severe restrictions on when and how such evolution can occur but there is no grounds for excluding it. I have a paper at http://www.nsof.co.nz which explores the mathematics and mechanisms of such evolution. Such explanations have the huge advantage of exactly matching observation and the fossil record without any recourse to ID. how did the debate turn out.